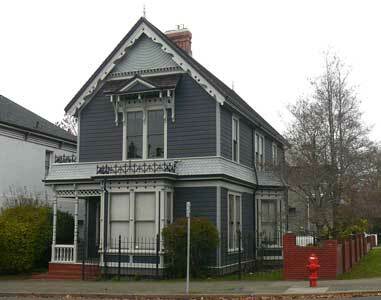 This is a two-storeyed, front-gabled, L-shaped Queen Anne cottage with unusual decorative details. The left side has a two-storey, gabled extension. The right side has a triangular bay on the lower floor. The front gable with its sawn bargeboards is divided by a horizontal dentilated moulding. Below the moulding is a pent roof with a central pediment on long cutout brackets. A pair of two-over-two windows beneath the pediment have an unusual, wide, cutout moulding above the upper casing. There is a pent roof beltcourse extending from the triangular bay on the right to the extension on the left side. A flat-roofed square bay below the upper front windows is to the right of the inset bracketed porch with its turned posts and turned spindles in the balustrade. The upper front gable has a curved shingle design; there are decorative shingles and iron railings on all the small roofs. The main body has drop siding. There is a recent rear addition. In the late 1970s, owners Foster and Connie Isherwood (1190 Fort St) restored this house; in 1980 they won a Hallmark Society Award of Merit for their efforts. Walter was a partner with Richard Hall (906 Linden Av, Fairfield) in Hall and Walker, which sold coal from the Dunsmuir, then Canadian Collieries mines of Cumberland, Ladysmith and Nanaimo. Walter was a school trustee in 1891 and 1923, and city alderman from 1916-18. The family moved in 1914 to 1750 Oak Bay Av. Mary Ann was residing with their son Fred, proprietor of the Walford Apartments, at 441 Victoria Av when she died. She was an active member of First United Church and women’s organizations. 1913: Kate Wallace Rome (b. Halifax, NS, 1857-1945), widow of accountant and merchant Andrew Rome. They were in Victoria in 1880 when their oldest son James Andrew Raymur was born; he became an insurance agent. Richard Francis was born in Portland, OR in 1886. Their third son Alfred Cecil was born here in 1889, when Andrew was working for Hall, Goepel & Co, wholesale liquor merchants and insurance agents. Marjorie Cecelia Baker had been born in 1891 just months before the census. However, by 1891 Andrew was gone and Kate was the head of the household, with four young children and four lodgers, three of them young bank clerks. 1914: Clarissa Phyllis Clements, bookkeeper with New Method Laundry. In 1916 she married William Arthur Hick (b. Victoria, 1895-1973) in Victoria; their mothers signed as their witnesses. William and Clarissa were missionaries in inland China from 1919-26. 1917-21: Jean Gunn McKean (b. Glasgow, SCT, 1866-1921), single and a dressmaker, came to Victoria in 1909. She owned the house until her death, although she lived her last year at 528 St Charles St, Rockland. 1926-31: Nurse Florence Clarissa Holmes (née Herbert, b. Bourne Brook, Worcs, ENG, 1876-1941), the widow of Frederick James Holmes. 1932: BC Rock Gas manager William Edward and Winifred Holland; William was later an employee of BC Hydro. 1933-53: Cecilia Frances Harrison (née Lowther, b. Amherst, NS, 1884-1978), the widow of Albert Edward Harrison.